Netflix, like God, is both omnipotent and elusive. It knows all about the 500 million hours you’ve spent watching Adam Sandler movies, yet when it comes to providing concrete answers—particularly about its ratings—it can be as blank and inscrutable as the face of a person who’s consumed a half-billion Sandler hours, lying slack-jawed in the harsh light of morning. The streaming giant doesn’t like to give out concrete numbers, so when it says something like Dave Chappelle’s new stand-up specials are its most-watched of all time, you must take it on pure faith. That’s what the company has averred in an internal company letter handed down to shareholders, a digital stone tablet proclaiming, “The triumphant return of a comedy legend in Dave Chappelle: Collection 1 was our most viewed comedy special ever,” so sayeth the service. Still, there is reason to believe in Netflix beyond gratitude for all that it has given you. Chappelle’s The Age Of Spin and Deep In The Heart Of Texas have certainly been among the service’s most talked-about, generating plenty of conversation on social media for several days surrounding their release, as well as in scores of articles asking whether his jokes about gay rights and Caitlyn Jenner crossed the line (or were even all that funny). That controversy is beside the point for Netflix, of course, which gets those obfuscated viewing numbers no matter what, and has seen Chappelle’s shows come out on top—not only of the 17 new stand-up specials it released this quarter alone, but of all of the specials it’s ordered so far. 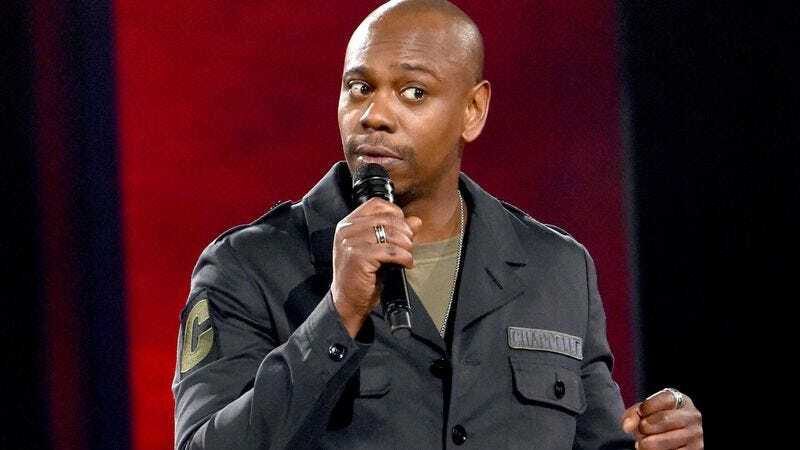 Chappelle’s success has bolstered Netflix’s confidence that stand-up comedy can continue to bring “series level and movie level of viewing,” so you can expect to see a lot more of those in the future. Just don’t ask for actual ratings information on them, lest your blasphemy be punished by it dropping even more movies you wanted to watch.